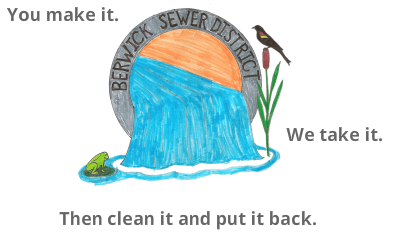 vision | Provide wastewater treatment for the members of the Berwick Sewer District in order to care for our environment now and in the future. mission | We will work to meet our mandated treatment limits while maintaining the assets of our District at the most reasonable cost to our members. What can you​ do to help? & how to help keep your sewer fees down. Board of Trustees are meeting on Wednesday February 27th at 5:15 PM at the District office. Have unwanted medications? DON'T FLUSH THEM DOWN THE TOILET. ​MedReturnME is a free and anonymous drop box program in York County where you can drop off any unwanted medications: prescription, over-the-counter, drops, ointments, and veterinary medicines. The local drop box is located in the lobby of the Berwick Police Department. Before dropping off medications, remove any personal information from the label. For more information, please contact the Berwick Police Department at (207) 698-1136.